Consider a house code to be an understated signature. They’re a collection of collected references that continue to appear in collections, no matter the season, trend, or year. House codes carry on and support a House’s legacy year after year after year; they’re what make a brand’s legacy distinct and memorable. These codes become identifying markers for a brand, intricately weaving themselves into a brand’s vision and dna. One of the strongest codes for the House of Herrera is the white shirt. Simple, reserved, and elegant, the white shirt has been reinterpreted and refreshed season after season. For Pre-Fall 2018, we saw it relaxed when paired with dark denim, and translated into an oversized shirt dress brushed with delicate embroidery. Fall 2018 reintroduced the white shirt as a boxy modern, and dappled with monochrome animal prints. 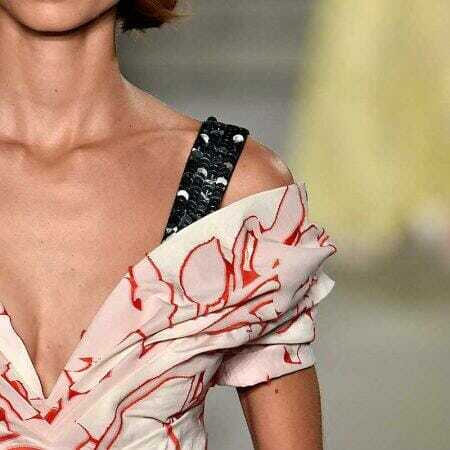 Most notably, the collection’s finale celebrated Mrs. Herrera’s signature look by combining the white shirt with another house code, the ball skirt. No matter the year or season, one always can expect this house code to make subtle appearances in each collection, just as you can expect to see iterations of evening gowns and colorful stripes.